Walter Hudson had a report last week on some of the latest circus antics happening over in Minnesota’s Second Congressional District, where Congressman John Kline faces a “challenge” from a man named David Gerson. Today’s fight is about granting access to data about delegates and alternates who are elected at precinct caucuses in a few weeks. At least we’ve moved on from T-shirts. Hudson’s piece outlines how CD2 Chair Bill Jungbauer helped create a policy at the State level about who gets access to the Party’s data, through a program called DataCenter. At a November meeting of the state executive committee, Jungbauer moved the adoption of rules governing access to the MNGOP database. Those rules allowed the party’s incumbents to retain access throughout the duration of their term. Flash forward to January, only two months later, and Jungbauer is trying to reverse the policy he voted for, and attempting to strip Congressman Kline’s access to DataCenter. He brought a motion to revoke Kline’s access as of caucus night. His efforts fell flat. On Thursday, Jungbauer delivered that motion to the state executive committee. His was the only aye vote. In reality, CD2 is getting the leadership they deserve for electing a chair who votes on things he doesn’t understand. After losing the vote at the State Executive Committee, Jungbauer is now calling BPOUs in CD2 and encouraging them not to share data with the State Party. This action, which is being encouraged by Gerson campaign staffer Marianne Stebbins, is utterly ridiculous. It would deprive statewide candidates access to data, all in the name of helping a joke candidate who has no shot at winning an election. This complete lack of perspective and common sense is unfortunately common amongst the type of people who are drawn to joke campaigns like Gerson’s. Reality is this: John Kline is going to get the list of delegates, John Kline is going to win the primary, and with luck John Kline will be re-elected to Congress this November, helping the GOP keep the majority in the House. I wish the children from the Gerson campaign would grow up and accept reality. Until then I’m just glad they aren’t in my district. Ever since the State Fair last August, there has been much discussion about the meaning of endorsement and how long it lasts. Several months ago this issue was discussed and the majority of state exec members agreed that endorsement runs until caucus night when campaign season begins. The issue of list use has also been discussed both at CD2 and the state. As chair of CD2 it has been my policy to provide all candidates with an even playing field. At one point I asked state party chairman, Kieth Downey, for his word that he would refer back to CD2 any congressional candidates seeking party lists. He gave me his word. Several weeks ago Marianne Stebbins, campaign manager for David Gerson, asked me about access to Data Center which is the national voter database. This is in the possession of the state party. I read her the state party policy which states that incumbent Republicans and endorsed candidates have access to it. I admit to moving to adopt this policy at the November 2013 state exec meeting. At our December CD2 meeting John Kline was asked if he would sign our list agreement, of which he said he absolutely would not sign such an agreement. He also said that he would get the lists he needs to be reelected and that anyone who runs for congress should get the lists too. I brought this issue to the attention of CD2’s exec committee. Erik Radtke arranged a conference call so we could have a discussion. It was agreed by all 5 members, Jeff Lorsung, Tiana Wells, Erik Radtke, Bron Scherer and myself that based on our desire to provide a fair playing field to both candidates as well as the fact that the state exec committee agrees that campaign season begins caucus night, that Congressman Kline’s access to Data Center should be cut off as of caucus night and that no candidate would have access until one is endorsed or wins a primary. I also called Tim Commers to ask if the Kline campaign would reconsider signing our list agreement. This was discussed and agreed upon during our conference call. At the January state exec meeting I asked that reconsideration of the list use policy be placed on the agenda. Which it was. I informed the committee of our resolution and moved that Congressman Kline’s access be cut off on caucus night. This was discussed. A vote was taken on the motion and it failed. I then moved that David Gerson be given access to Data Center. This motion also failed. Chairman Downey gave me his word he would refer any candidate for congress wanting access to lists back to CD2. Chairman Downey has presented the state committee with several policies that protect incumbents from challengers. Data Center use, State Fair booth policy as well as a discussion on punishing anyone who challenges an incumbent Republican. See Michael Brodkorb’s article on this one. John Kline refuses to sign our list agreement. Why should he have access to caucus attendee data? Chairman Downey agreed that Kline would get such data via a back-door as all caucus attendee data would be entered into Data Center. David Gerson signed our list agreement without hesitation. The state exec committee agrees that campaign season begins on caucus night. The state exec committee agrees that endorsement runs to caucus night. It is the decision of CD2’s exec committee that Kline’s access to Data Center should end on caucus night. CD2 payed the state party $1500.00 for voter ID to be entered into Data Center therefor we have a monetary stake in it. Chairman Downey has said that Data Center belongs to the state party. It belongs to all of us. Every CD. Every BPOU. This reeks of top-down rule rather than anything resembling a grassroots, bottom-up organization. I have received calls from all over asking how this could have happened. Ever since January 16th, the evening of the state exec meeting, I have been debating on how to handle this. As you all know, I’ve always been transparent in everything I do concerning the operations of CD2. Therfore the only solution I can suggest is that all BPOU’s make copies of their data on caucus night and forward it to CD2. We will enter all data into the CD2 data base and retain it as a bargaining chip with the state party. I am suggesting that all BPOU’s in CD2 refrain from giving the state party any data on caucus night. I cannot tell any BPOU to do this as I respect each and every BPOU to make decisions as they see fit. I only suggest this as the only option I can come up with. We do this, or we do nothing. It’s your decision to make. During the month of January I’ve spent many hours entering data into a CD2 data base which now has over 400,000 voters from 291 precincts within CD2. It’s been tons of work. We can make it even bigger with your help. I can assure you that this data is ours and will be used for any and all races within CD2. Please feel free to comment or make suggestions. In the past my Senate District has used Precinct Finder forms to help get people to the right precinct for Caucus. We weren’t exactly sure where they came from in the past, so this year we decided to make our own, using data we purchased from the Secretary of State. 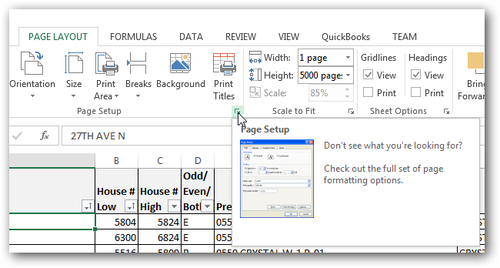 You can too, using this spreadsheet, and these instructions. 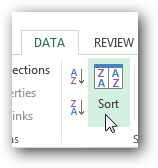 My instructions use Excel 2013. 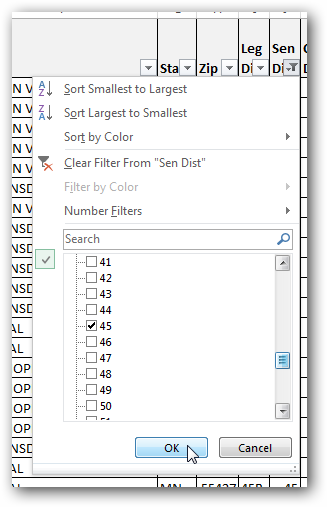 If you’re using a different version of Excel, your options may be in a different place, but everything should still work. My BPOU is a Senate District, and for caucus all of our precincts meet in the same place, so we’ll make sheets for each city to make lookup faster. If you have a different setup, you can use the various filter options to get only the data you need. Step 1: Download the spreadsheet. This has all of the precincts for MN on it. Step 2: Turn on the Filter option, if it isn’t already. Step 3: Filter by your first option. I used Senate District. 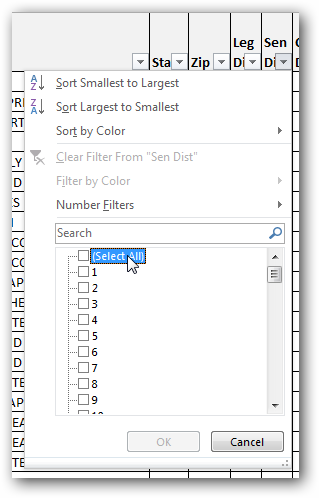 Uncheck the “Select All” option. Step 4: Select the item you want to include. I selected District 45. 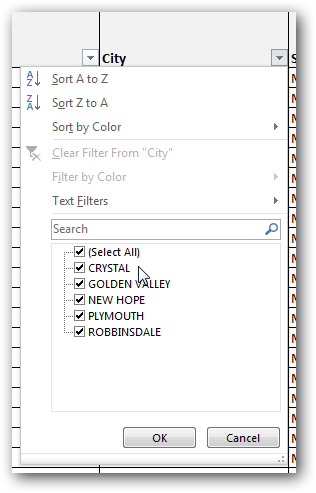 Step 5: Select your next filter criteria. I used City, and am going to create the sheet for Crystal. Step 6: Now I have all of the data filtered. I need to make sure it’s sorted correctly. Go to the Sort option. Step 7: Sort the data. We sort by Street Name, then House # Low. You can choose a different sort if that makes sense for you. Step 8: Check the print preview to make sure everything will print as you expect it to. You can see I have all the columns on one page, and it will print 9 pages. Step 9: If you want to get really fancy, you can print a custom header on each set of sheets. Go to the Page Setup dialog box. 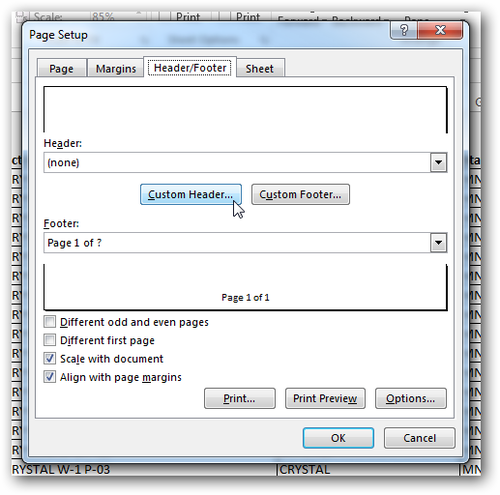 Step 10: On the Header/Footer tab, create a custom header. Step 11: Verify your header, then print. My BPOU creates a stapled packet for each city. When people come up to the table, we ask for their street name (“Main Street”) then their Address Number (“1234”). The sheet provides a range of addresses. For instance, 1000 - 1999 Main Street would be Precinct 1, 2000 - 2349 Main Street would be Precinct 2. Sometimes there are different ranges for odd and even sides of the street. Note the Odd/Even/Both column. I got this data from the Secretary of State and reformatted it a bit to make it easier to use. 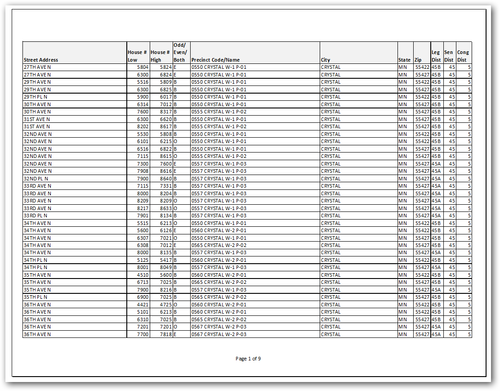 If you want the raw data that came from the SOS, click here for the full file. Copyright note: Permission is granted to any Minnesota Republican Party Unit to freely reproduce, repost and/or distribute the content of this post, including pictures and file attachments. If you have technical questions, contact me using the contact form on this website and I will try to help you out. Good luck with your caucus! The Minnesota Tea Party Alliance announced the other day that Maricopa County Arizona Sheriff Joe Arpaio will be headlining their first quarter Tea Party event. This confuses me, as I’m not sure how Arpaio fits in with the Tea Party’s principles of Free Markets, Fiscal Responsibility, and Limited Government- specifically the last two. Like most people who don’t live in Arizona, I was familiar with Arpaio through his national media interviews. (I later learned he never gives local interviews.) In those appearances he would put forth his best “tough guy” routine and talk about how he doesn’t take no guff from nobody. He makes the inmates wear pink underwear. He feeds them on pennies per day, etc. His media team has done well in developing his old-time, wild-west county sheriff image. I bought it, hook line and sinker. If you were to search the campaign finance records in Arizona, you’d see me listed as a donor to the Sheriff. That donation was made in 2008, shortly after I arrived in Phoenix. Sheriff Joe has perfected the “I’m under attack and I need your money to fight back” routine. (Remind you of anyone?) I threw him a few bucks. I voted for him. He won. It wasn’t close. It was only after I got more involved in Arizona politics that the real Joe Arpaio started to become clear. Arpaio’s opponent in 2008 was Dan Saban, the former Police Chief of Buckeye, AZ. He ran against Arpaio in 2004 as a Republican, and then decided to try as a Democrat in 2008. To be sure, Saban was a deeply flawed candidate, but his loss was guaranteed, in part, by illegal collusion between the Arizona Republican Party and a supposed independent group called the Sheriff’s Command Association (SCA) that was run by Arpaio’s chief deputy, David Hendershott. In 2010, I was an advisor for the campaign of Rick Romley for Maricopa County Attorney. Romley was the county attorney from 1989 - 2004, when he retired. After Arpaio ally county attorney Andrew Thomas resigned amid scandal (he was later disbarred, and is now running for governor) Romley was appointed interim county attorney until a special election was called, and decided to run for another full term. Romley ran on a platform, in part, of reigning in Arpaio, who was seen as having free reign under the Thomas administration. Arpaio, sensing that his life would be quite a bit harder under an independent county attorney, spent over $700,000 of his own campaign cash campaigning against Romley. The Arizona Republic has a great recap of Arpaio’s career in an article entitled Joe Arpaio, America’s most expensive sheriff. That article lists some of that particular highlights of Arpaio’s tenure as sheriff, like the $17 million in lawsuit settlements that Maricopa County has paid out (so far), and the added cost to taxpayers from the burden of new measures the Sheriff’s office is forced to take after a Federal Judge found the department guilty of repeated civil rights violations. It only touches on the use of the laughably named “anti-corruption unit” as a tool to punish political enemies. The Minnesota Tea Party Alliance claims to stand for Fiscal Responsibility and Limited Government. I wonder if they were aware of Arpaio’s true record when they invited him to speak. I’m sure like most people outside Arizona, the organizers were only aware of Joe from his national media, like I was before 2008. Now that they know the rest of the story, I hope they rescind the invitation, because Joe’s record sure doesn’t sound like fiscal responsibility or limited government to me.